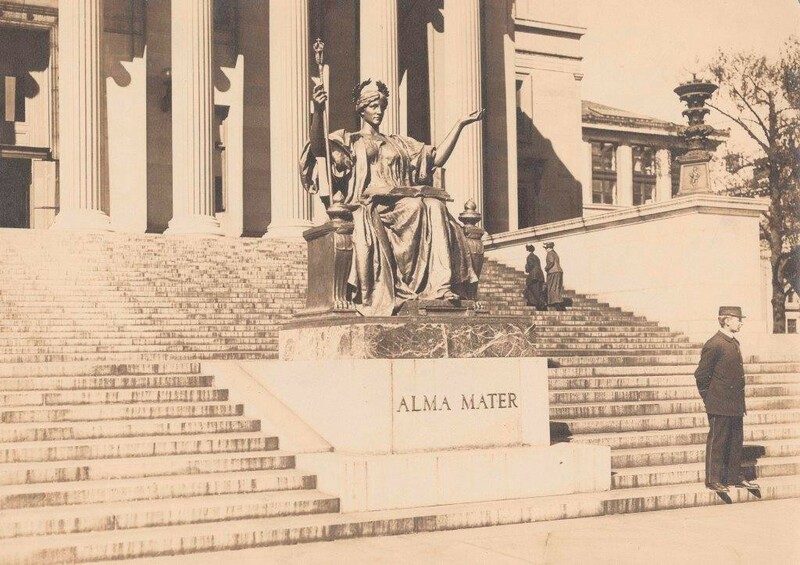 Throughout the century, the Alma Mater statue witnessed change and conflict on Columbia’s campus; but she also helped create new traditions that fostered a sense of community among Columbians. Almost immediately, Alma Mater became known for the tiny, hidden owl buried in the folds of her skirts, and throughout the next several decades, Columbia students and faculty debated its significance. What did the owl signify? And why did French include it in his design? Many College men (until 1983, the College admitted only men) joked that any student who found French’s owl would marry a Barnard girl. Still others claimed that the first member of the College’s freshman class to find the owl would be valedictorian four years later. View of Alma Mater in gold leaf with guard standing at her base and two women walking up the stairs to Low Library. As the most visible symbol of the school, Alma Mater also found herself the victim of many college pranks. In 1928, the Buildings and Grounds crew discovered that the crown that sat atop the statue’s scepter had disappeared. After the University offered a reward for the crown’s safe return, a young man delivered it to the school, claiming he had found the crown in a restroom and, not recognizing it, kept it until he learned of the reward. A few years later, undergraduates gave the grand dame of Columbia a bright red manicure and pedicure. "Columbia University’s ‘grand old lady’ is 50 years old today," University Symbols: Alma Mater, Historical Subject Files, University Archives, Rare Book & Manuscript Library, Columbia University in the City of New York. Letter to the editor, New York Times, October 27, 1953, University Symbols: Alma Mater, Historical Subject Files. "Columbia’s Alma Mater Robbed of Crown; Under Canvas Cover She Awaits Its Return," New York Times, August 8, 1928; clipping, “Stolen Crown Restored, Columbia Unveils Her Alma Mater Statue,” New York World, August 24, 1928; "Vicissitudes of City Statues: Jokers and Vandals Find targets Ready to Hand," New York Times Magazine, May 10, 1936; Columbia University press release, "Alma Mater's Scepter is back at Columbia, unharmed" December 19, 1984, University Symbols: Alma Mater, Historical Subject Files.